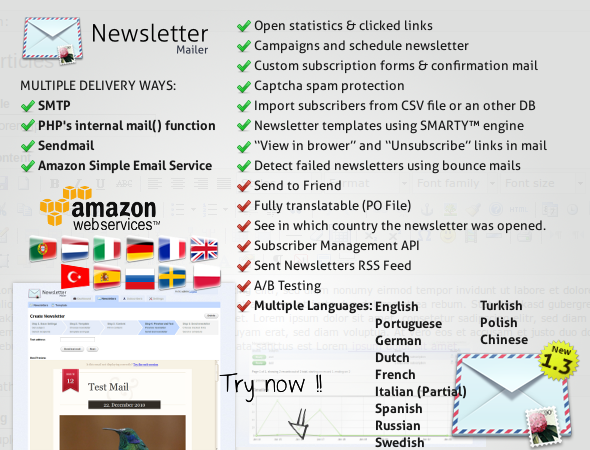 Newsletter Mail System for vldPersonals « Mods and Tutorials for VldPersonals. Hire us to design your site. This week VldMods will Recommend you this great Newsletter Mail System. The Newsletter Mailer is a powerful email marketing tool. This has got multiple features. It is important for us site owner, we could send newsletters to our members and also friends. We can do it today with vldPersonals but it is not so easy send a nice newsletter with that system ! Take a look at this demo and you will understand that I´m talking about ;) not so easy to do with vld. So let your site grow and get much more members, the secret is let everybody talk about it ! How to send a newsletter and that should I write about ? sometimes not so easy ! I will tell you how you should make and write a good newsletter ! Okey my friends today I will buy this Newsletter Mail System. and use it here on vldMods it is really cheap cost only 14USD. If you need help integrate it for vldPersonals please read this first. and if you still don´t know how to do it contact me and I will help you. @Paul: I will be back later and tell you, then our coders had time to help you. had you read the documentation how to do ! look at the bottom of the post and you will found it ! Vld can send periodically (i.e. once a week) the matches of members via this mod? What is the author ?